The original white foam core board was made in 1/8 inch (3 mm) and 3/16 inch (5 mm) thicknesses for the graphic arts industry by Monsanto Company under the trade name Fome-Cor starting in 1957. Monsanto sold the business to International Paper in 1993, and the business is currently operated by 3A Composites. It is now widely-used as backing in art and document mounting and picture framing, with archival quality variants now available from several companies. Today there are several other competitors, as well as a generic version. It ranges in thickness from 1/16" - 1/2". It is not recyclable or biodegradable in normal situations.. It ranges in thickness from 1/16" - 1/2". It is not recyclable or biodegradable in normal situations. Today there are several other competitors, as well as a generic version. It ranges in thickness from 1/16" - 1/2". It is not recyclable or biodegradable in normal situations. Foam boards are made with a polystyrene foam core and either a white clay coated, black or brown Kraft paper facing. The way the polystyrene bubbles are formed during manufacture allows the edges to stay sealed, or at least crimped, during die cutting. This creates a characteristic pillow effect. It also means that any accidental impressions or dents can permanently damage the foam board. The foam center is not affected by moisture, but the surface paper is, and outdoor use as well as wet mounting can be a problem. The surface of foam boards will readily accept oil paints and acrylic paints, but the foam is sensitive to solvents, particularly those in lacquers and shellacs. Monsanto produces an acid-free Fome-Cor where the surface paper is buffered to a pH of 7.5 to 8.5. Fome-Cor® Acid Free is comprised of extruded polystyrene foam with acid-free paper facers that meet Library of Congress standards for conservation framing. Perfect for the archival preservation of valuable art and photographs. 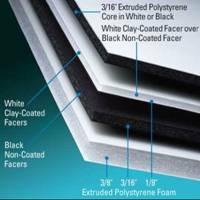 No additional backing is required, saving time and framing materials The acid-free foam core is produced in thicknesses of 1/8 and 3/16-inch, and sizes of 32"X40" and 40" x60". The super thin variety is identical to the original foam board but is -1/8-thick instead of 3/16-inch. The available sizes are 30" x40", 32" x40", and 40" x 60". The surface of the regular board, like many other types of paper, is slightly acidic; for archival picture framing and art mounting purposes, Alcan also now produces a neutral, acid-free version with a buffered surface paper, and similar products are now available from competitors in a wide range of sizes and thicknesses. Foam cored materials are also now available with a cladding of solid styrene and other rigid plastic sheeting, some with a textured finish. Foam core does not hold up well to some glues, such as superglue, and certain types of paint. The foam tends to melt away and dissolve. While Elmer's White glue works well in casual settings, the water in the glue can warp the fibers in the outer layers. White Craft Glues work better as they have a very little water to contend with and dry clear & flexible . Best results are typically obtained from the higher-end spray adhesives such as 3M's Super 77. A hot glue gun can be used as a substitute, although the low viscosity of hot glues can affect finished projects in the form of board warping, bubbles, or other unsightly blemishes. Also on the market currently are self-adhesive foam boards, intended for art and document mounting, though these can be very tricky to use properly; this is because the glue sets very fast. It is considered cheaper to buy plain foam board and then re-positional spray mount adhesive as you will not make as many mistakes. Nielsen Bainbridge, a picture framing materials manufacturer, now produces a type of archival foam core board as part of their "Artcare" line (which includes acid-free mat boards); these boards are buffered to repel airborne pollutants, and the company also claims that these boards are constructed in such as way as to lack the problem of foam out gassing. Foam core is commonly used to produce architectural models, prototype small objects, and produce patterns for casting. Scenery for scale model displays and dioramas and games such as Warhammer, Lord of the Rings Strategy Battle Game and Void, is often produced by hobbyists from foam core. It's also often used by photographers as a reflector, in the design industry to mount presentations of new products, and in picture framing as a backing material; this latter use includes some archival picture framing methods, which utilize the acid-free versions of the material Foam core cuts easily with a razor blade, if the blade is sharp and without defects; if it is not, it can tear the foam board instead of cutting it. My experience with this particular foam board is that it behaves as if it had a grain and tends to cut well in only one direction. This board is commonly used in dry mounting and vacuum mounting, as well as in wet mounting when counter mounting is done. Insite® Flame Resistant is ideal for use in places of public assembly such as trade shows, hotel meeting rooms, schools, theaters, malls and retail environments. A multipurpose foam board, utilizing new innovative foam technology, INSITE REVEAL features a new REVEAL foam center that is specifically designed with memory to retain it thickness during processes such as mounting, laminating, screen-printing, and die-cutting. INSITE REVEAL incorporates new smooth paper liners with heavier surface coatings that promote superior ink holdout and increased print gloss while screen-printing. The coating also acts as a barrier to minimize adhesive absorption while maximizing mounting and laminating speeds. Applications include signs, displays, exhibits, photo mounting, digital imaging, framing, crafts, toys, sets, props and presentations. A premium foam board at less than premium prices. The combination of a rigid foam center and double thick, brilliant white surface liners, that are ph neutral and contain UV inhibitors to minimize yellowing and fading. The high density foam produces a rigid, dimensionally stable sheet. Also available in matte black. Look into the features of Ryno, exceptional warp resistance, superior compressive strength, super flat surface, highly water resistant, die-cuts and hand cuts easily. DIAMONDFOAM® is a high density rigid urethane foam, and is completely waterproof and resistant to solvents, for indoor and outdoor use. Diamond foam is a practical replacement for most wood applications especially in areas of harsh temperatures. Due the its tight cell structure Diamond foam does NOT absorb water which causes cracking, warping and peeling. The foam does not have a grain direction which means it will always lay flat, even after prolonged exposure. Diamond foam can be fabricated using standard or computerized tools and machinery. board for more than 40 years. It is comprised of extruded polystyrene foam with clay-coated white or black paper facers. Foam-X is produced by 3A composites. With all its similarities to Fome Cor, it has some significant differences. The formation of the foam bubbles and their higher density in this board allow for better retention of shape and minimize damage. This board is said to have "memory" because slight indentations tend to heal themselves. Consequently, in die-cutting the edges do not crimp or seal as they do with Fome Cor. I have found that Foam-X does not have any directional cutting resistance and cuts well in all directions. It is manufactured in the same sizes as Fome Cor and is also available in an acid-free version. This board is now produced with a UV inhibitor to reduce the possibility of ultraviolet light breaking down the foam. There are two thicknesses-0.125 inch, or '/e inch, and 0.210 inch, which is almost 1/4-inch thick and is thus often referred to as '/a-inch nominal. Primex prefers to use thousandths of an inch rather than fractions in referring to thickness. The surface pH is between 6.5 and 7.0 for the regular surface and 7.5 for the acid-free surface. Foam-X is a little more expensive than Fome-Cor.